As the second son of Hermanus Koekkoek (1815-1882) Willem Koekkoek represented the third generation of an extended family of painters that began with his grandfather, Johannes Hermanus Koekkoek at the turn of the nineteenth century. Born on January 3, 1839 in Amsterdam, Willem was raised to continue the family art business. All four of the Koekkoek brothers studied the visual arts primarily with their father, perhaps with occasional guidance from one of their three uncles who were also painters. It was Koekkoek’s father, Hermanus, who was widely recognized, however, and whose reputation as a marine painter would bring international acclaim. Although educated as a painter in his father’s studio, Koekkoek also trained as an architect, and most likely practiced briefly in that profession. His enthusiasm for the built environment might well be explained by the industrial developments that he witnessed around him as a child. Like most European cities in the mid-nineteenth century, Amsterdam was experiencing a gradual expansion as it emerged from the vicissitudes of the Napoleonic Wars. In fact, the year of Koekkoek’s birth also saw two significant developments specific to The Netherlands. First was the signing of the Treaty of London which separated what is today Belgium from the United Kingdom of the Netherlands; and second was the opening of Holland’s first railway line, the cause of much public celebration when it made its maiden voyage from Amsterdam to Ghent on September 20, 1839. Witnessing this newly industrialized world as it evolved during his childhood, it is easy to imagine that Koekkoek’s youthful aspirations may well have included the design of buildings for the future. Why he ultimately chose to work within the family tradition of painting remains unknown; however, his subject matter continued to focus almost exclusively on cityscapes and depictions of the architectural environment. The early years of Koekkoek’s career as a painter were facilitated by his father’s position as a leader of contemporary Dutch painting, and his role in local fine arts academies and societies in Amsterdam. However, Willem Koekkoek appears to have made his exhibition debut in 1859 in Leeuwarden, the capitol of Friesland province north of Amsterdam, although the specific location and conditions of this exhibition are not known. Koekkoek’s subsequent exhibition history included annual participation in shows at art academies in Amsterdam, The Hague and Rotterdam from 1865 to 1894, and most likely private galleries in London as well. In other words, he worked consistently and successfully once he established his name as a painter. 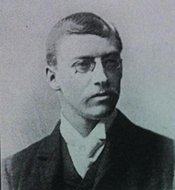 It should be noted in the context of names that Willem Koekkoek was also distinguished by the fact that his first name was the only one not repeated in every generation of his artistic lineage; a piece of good fortune in maintaining his individuality among the uncles, brothers and nephews who shared their first names with multiple generations of other family members. The years between 1859 and 1865, when Koekkoek began to exhibit at the annual Royal Academy show in Amsterdam, may well have been spent traveling through other parts of The Netherlands and south into the Rhine River valley. His fascination with urban environments drew him to a number of Dutch cities including Gouda, Enkhuizen, IJsselstein and Breda, all of which emerged later as cityscapes based on his sketches. Koekkoek also established contacts with the art world of London, probably at some point during these years. His slightly younger cousin, Hendrick Pieter Koekkoek (1843-1890), may have moved to London early in his artistic career, and it may have been through this him that Willem was initially introduced to the British capitol. Regardless of how he was introduced to the London art scene, though, his work soon became popular with British collectors, and many of his paintings found a positive reception in the homes of industrial entrepreneurs. The market for Dutch painting had long been strong in England, with seventeenth and eighteenth century Dutch genre artists being especially popular among the aristocracy. As industrialization created a whole new class of businessmen in the nineteenth century, Dutch painters found a natural market for their landscapes, marine scenes and genre scenes among newly rich men who sought to develop a cultured and sophisticated appearance despite their modest social origins. 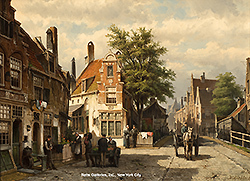 Koekkoek’s cityscapes offered this audience images of urban scenes featuring ordinary people going about their daily activities, but focusing on the distinctive architecture of prosperous Dutch cities created largely by the Protestant, middle-class merchants of previous generations—an example that a rising English businessman might hope to emulate. In addition, these paintings evoked the genre tradition of the seventeenth-century Golden Age masters while simultaneously emphasizing a more contemporary sensibility in the handling of light and color. Koekkoek’s frequent use of densely textured paint, as seen in Nieuwmarkt in Amsterdam in Winter, for example, is reminiscent of the approach used by the Pre-Raphaelite Brotherhood, whose works were often favored by mid-nineteenth century industrialists. At some point in the 1860s, Koekkoek married Johanna Hermina and settled down to a less peripatetic life. New family responsibilities may explain why he began exhibiting regularly at the official academy exhibitions in 1865 as well. His first son, Hermanus Willem, was born in 1867, followed by Marinus Adrianus in 1873. Following the Koekkoek tradition, both boys became painters under their father’s tutelage. The family settled in Amsterdam when the children were young and then spent a brief spell in The Hague and Utrecht in 1878, where a daughter, Georgette Sophie Marie, was born. This placed Koekkoek directly in the midst of The Hague School painters during in the late 1870s and early 1880s. This loosely affiliated, independent-minded group was influenced by the French Realists and the Barbizon School, whose emphasis on the common people was central to their aesthetic. Although Koekkoek’s work is more closely based on Golden Age precursors than than most of The Hague School painters, he nonetheless shared their interest in presenting ordinary people with dignity. Unlike the peasant genre scenes of the seventeenth century, Koekkoek’s urban residents are neither buffoons nor louts, but respected middle-class citizens going about their daily work. In 1880, Koekkoek returned to Amsterdam to live once again. His seventy-five year old father was living there, and perhaps it was also time for his oldest son, then thirteen, to be in the capitol in order to begin serious art studies. The next five years were eventful. Hermanus Koekkoek died in 1882, and shortly thereafter, Willem’s youngest brother, Barend Hendrick (1849-1909), decided to move to London. This gave the family a secure entrance into the London art world, which seems to have been especially appealing to Koekkoek. He is known to have visited in 1888, but it is probable that he visited a number of times during these years. In fact, his son Hermanus Willem (1867-1929) eventually moved to London where he not only painted, but worked as an illustrator for The Sketch and The Illustrated London News. In his mid-forties, Koekkoek made one last move, this time to Nieuwer Amstel (Amstelveen) a community just south of the Amsterdam city limits. The reason for this move is unclear, although his father had lived there for many years, so perhaps there were family ties to the area. Koekkoek continued to paint numerous cityscapes for his English patrons, exhibiting in London galleries as well as at the Amsterdam Academy annual show until 1894 when he stopped painting, probably because of ill health. He died January 29, 1895 in Nieuwer Amstel just a few weeks after his fifty-sixth birthday.